After weeks of waiting and then a further few hours spent frantically trying to download and install the new update, last night (June 21st) we finally managed to get iOS 4 live and kicking on an iPhone 3GS handset before putting it through its paces. iOS 4, the new operating system for the iPhone 3GS and the third gen iPod Touch, launched yesterday bringing multi-tasking to the Apple devices. Although also supplying the iPhone 3G with many new features, the older handet is not capable of supporting the coveted multi-tasking that is making iOS 4 the talk of the tech town. With the new OS finally installed, we were excited to see if Apple's former elephant in the room had once and for all been put to rest and covered with the glossy sheen of silky smooth efficiency that we have come to expect from the Cupertino Company. First impressions of the new OS's multitasking capabilities are promising although undeniably still some distance from the finished package that we had hoped for. A double-tap of the home button when in one application might well present a list of all other open apps without closing the current screen butthe transition between apps is far from the seamless exchange desired. Possibly more of a reflection of the current app capabilities than the new OS, multitasking is still not all-encompassing feature. An example of this is the Spotify app, a firm favourite in T3 Towers, which still frustratingly lacks the multitasking capabilities that would allow users to continue to listen to their Spotify tunes whilst using another application. Folders are an altogether more promising example of the finished and pristine package that we have come to expect from Apple. Holding down an app icon and moving it over a second creates a folder that is then automatically given a relevant folder namedepending on its content. For example creating a folder containing the Facebook and Twitter applications will see the space-saving tool rename itself 'Social'. More than an efficient space-saving addition the folders function allows for organisation of a device that previously had a slightly havoc induced layout. Other areas in which iOS 4 offers instant improvements and desired additions is through the ability to merge all email accounts into one continuous stream. The combined stream allows for fast, easy browsing and an altogether more convenient experience. Less practical yet still a desired inclusion of the new OS is the ability to stray from the previously bleak but required black background image as users get the option to customise their homescreen with an image of their choice. With Steve Jobs touting over 100 new features to iOS 4 upon its unveiling at WWDC earlier this year, there is still much to explore and try with the new operating system. Stay tuned to T3.com for a full review of iOS 4 coming soon. 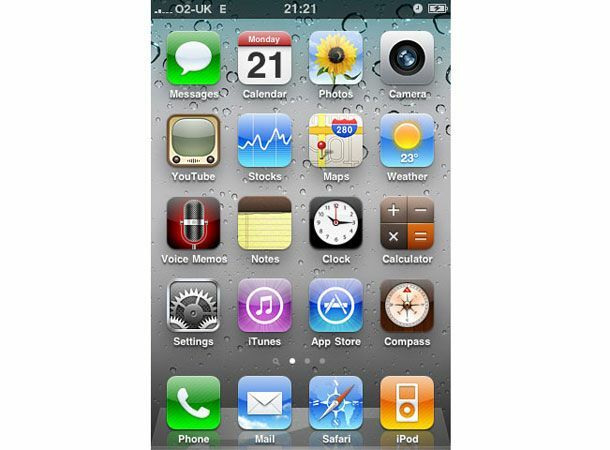 iOS 4 will become a new dominant force in the smartphone market later this week when the Apple iPhone 4 hits the shelves this Thursday (June 24th) pre-loaded with the new operating system.